A 32-year-old patient came to Universidad Internacional de Cataluña. 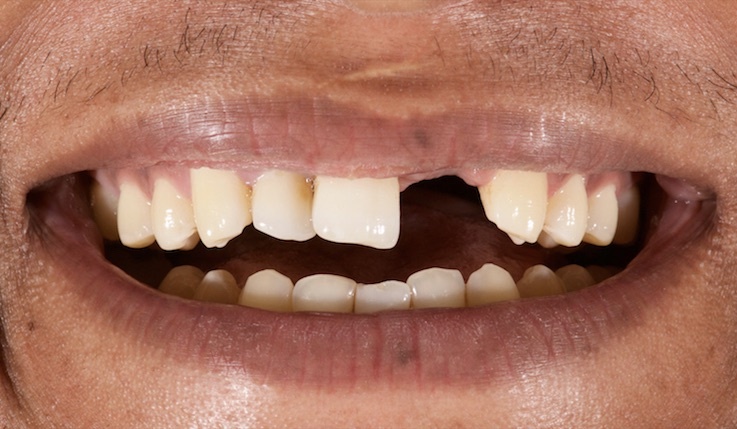 The male patient's chief complaint was a missing central and lateral incisor which had been extracted several years earlier. 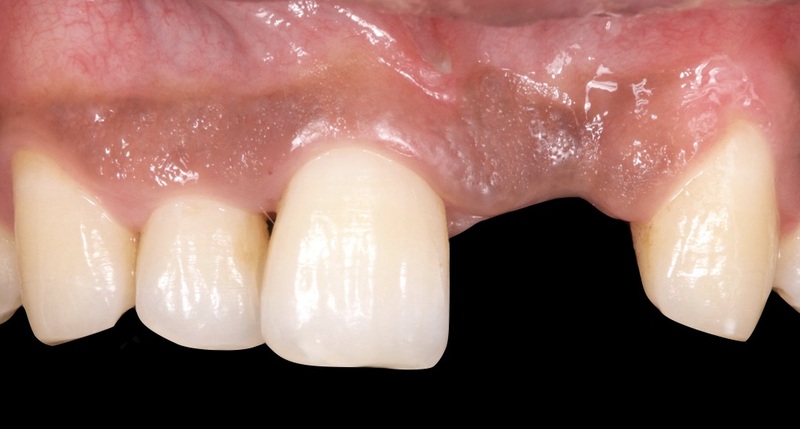 The site presented significant loss of hard and soft tissues, the midline deviated to the left which could eventually compromise the aesthetic result of implant treatment. The overall health status was good and there was no concomitant oral disease; therefore, a two-stage implant procedure was planned. Two treatment options were offered: a single implant leaving a diastema on the middle line and the second option with a full anterior rehabilitation with veneers and an implant on the central incisor. 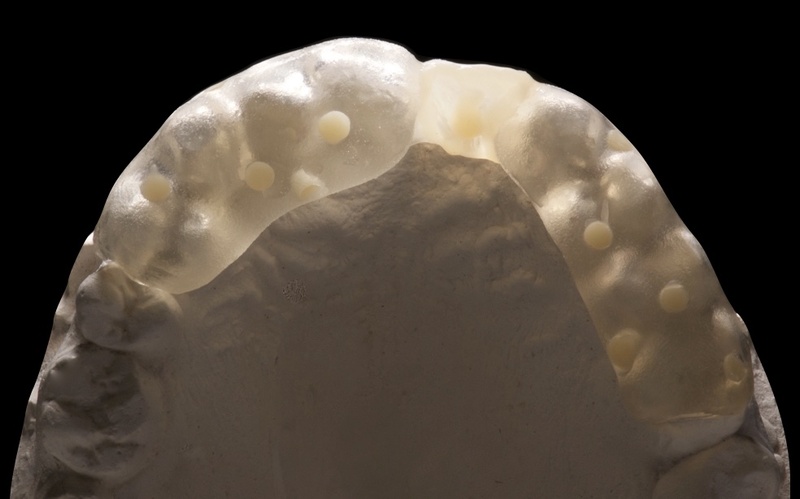 A Porcelain-fused-to-metal crown over implant with a GBR and a collagen membrane on #21 (FDI)/ #9 (US) was chosen from the patient after presenting him the different option plans. 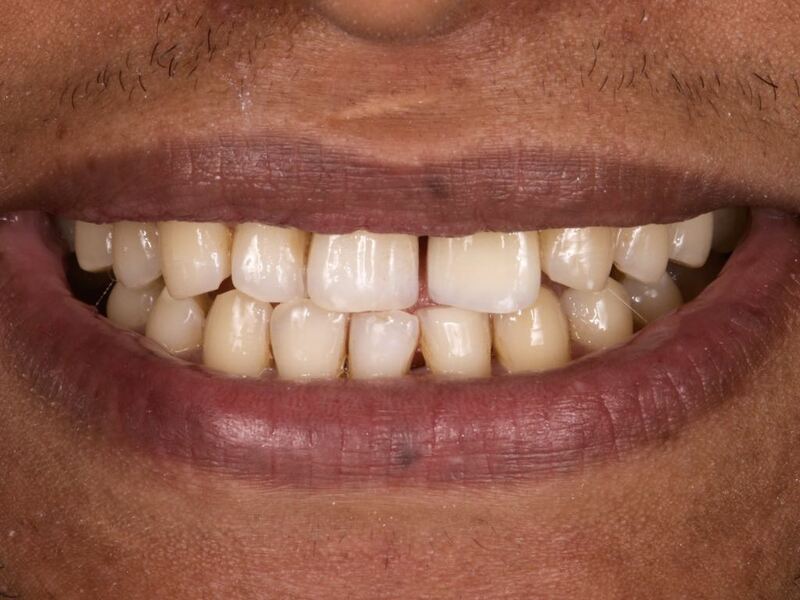 The patient was very satisfied with the overall result of the treatment, the final crown being harmonic to the contralateral tooth and the soft tissues with a healthy and natural appearance, despite the absence of the lateral incisor. 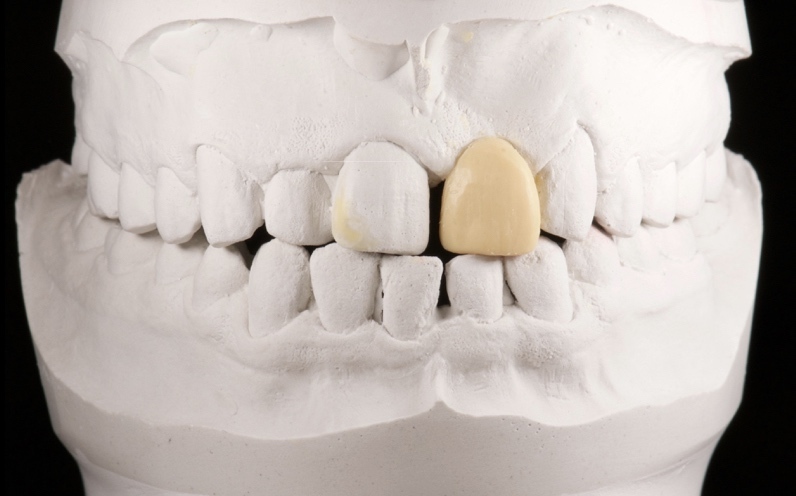 Dentolabial analysis. 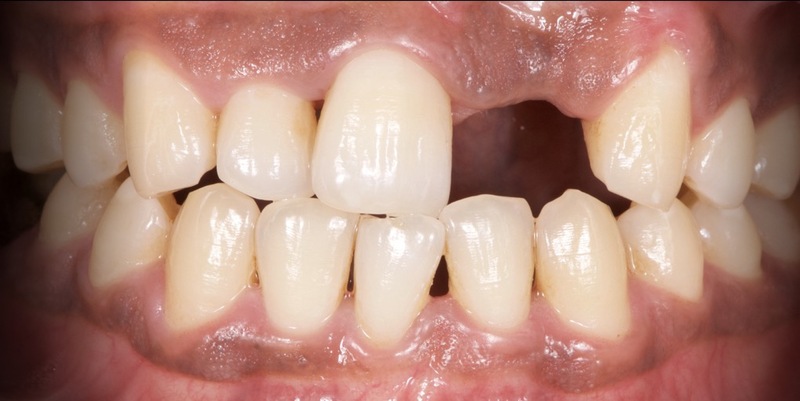 The patient presented with a missing upper central and lateral incisor. 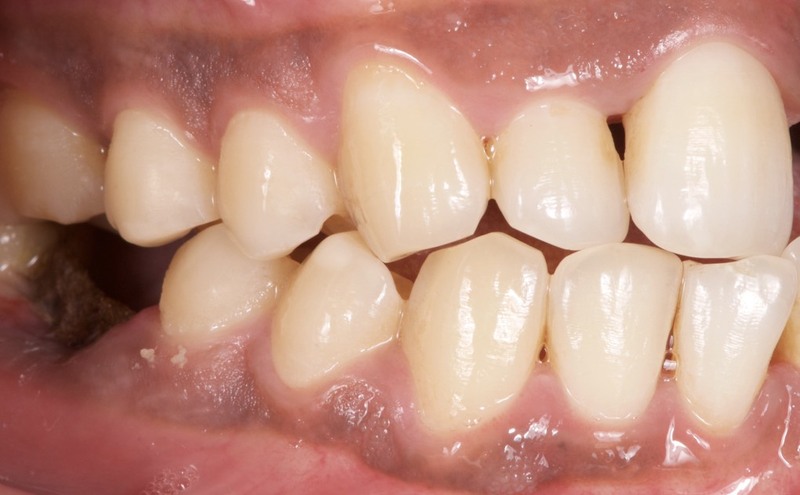 He has a low smile line (exposes less than 75% of the anterior teeth). 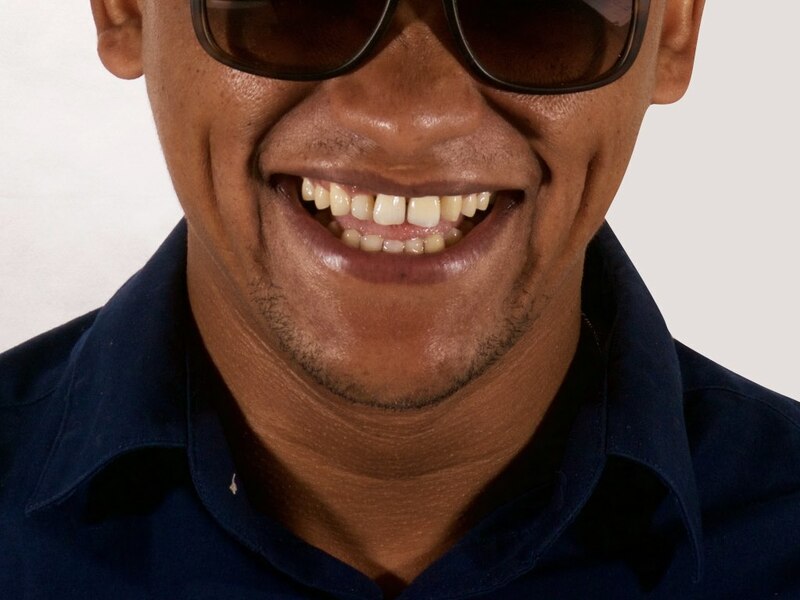 His upper interincisal line does not correspond to the facial midline. 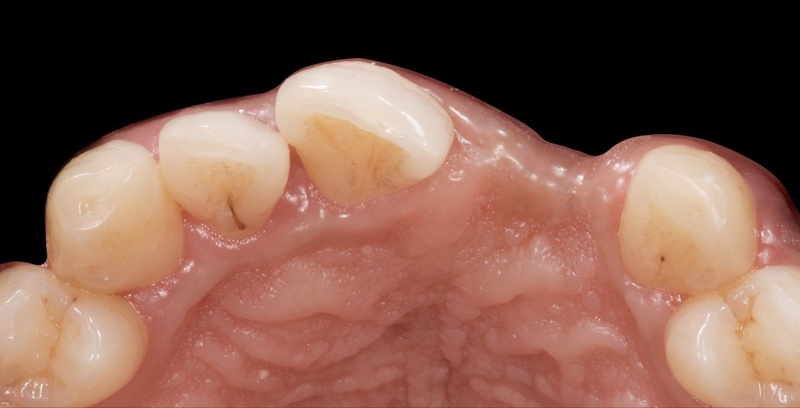 In the intraoral analysis presents natural dentition, A2 color and square form. Dental malposition (rotation and anterior edge to edge bite). The hard and soft tissues had a vertically and horizontally collapse. Right lateral intraoral view. Absence of #46 FDI / #30 US due to vertical root fracture. Occlusion type Class I and attrition on the canines. Left lateral intraoral view. 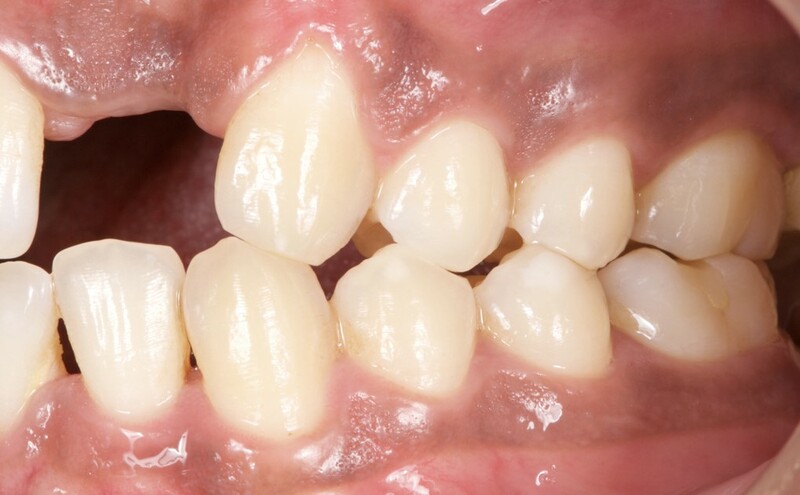 Class II malocclusion. Anterior upper intraoral view. He presents “thick - flat” gingival biotype on the central and lateral incisor and “thin – scalloped” biotype on the canines. Occlusal view of site to be treated. Note the concavity of the buccal contour, indicating loss of the buccal plate of bone. Digital Design Planning for the implant placement according to the midline and the proportions needed. The diagnostic wax-up brings the treatment plan from conception to a full-scale model. Occlusal wax-up view. Helps to determine optimal clinical and laboratory procedures necessary to achieve the desired esthetics and function. In this case we gave harmony to his smile by rotating the central incisor missing. 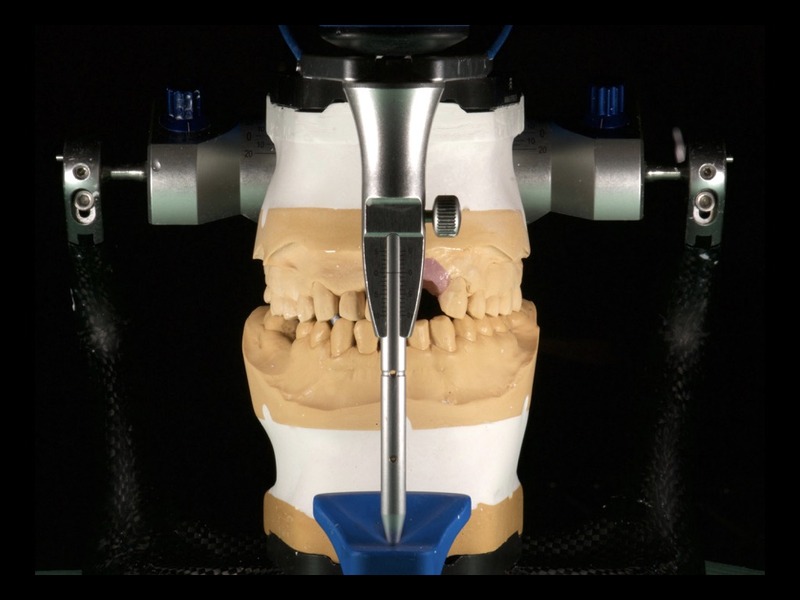 Occlusal view surgical guide that shows the exact position needed to place the implant. 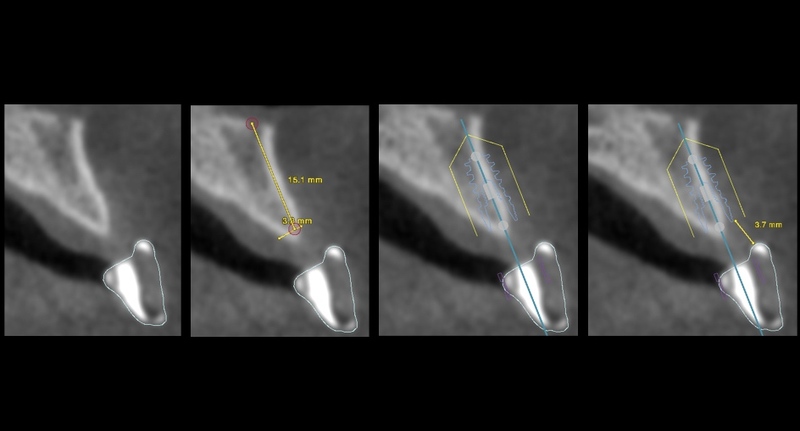 CBCT cross-section of the site to be treated. Implant drill using the surgical guide for the correct position. Making the provisional over implant with a silicone matrix for the correct position. 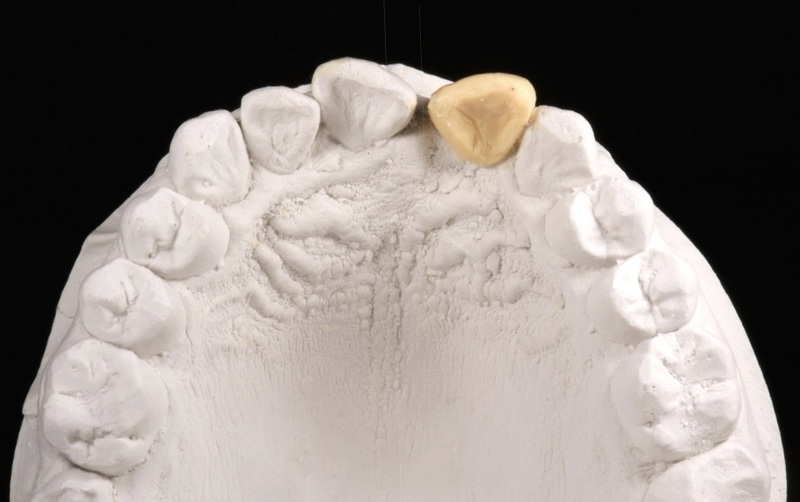 Making the provisional from an occlusal view according to the way-up. 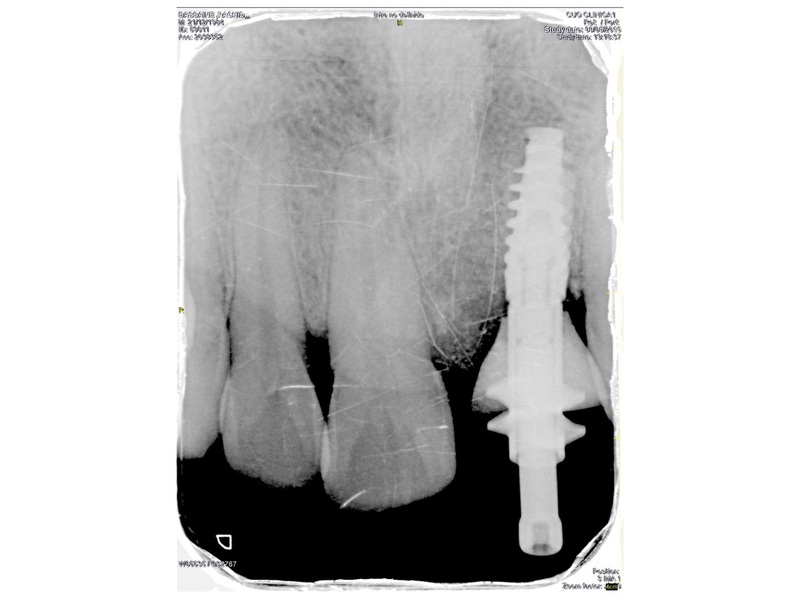 Intra oral view of the provisional over implant. 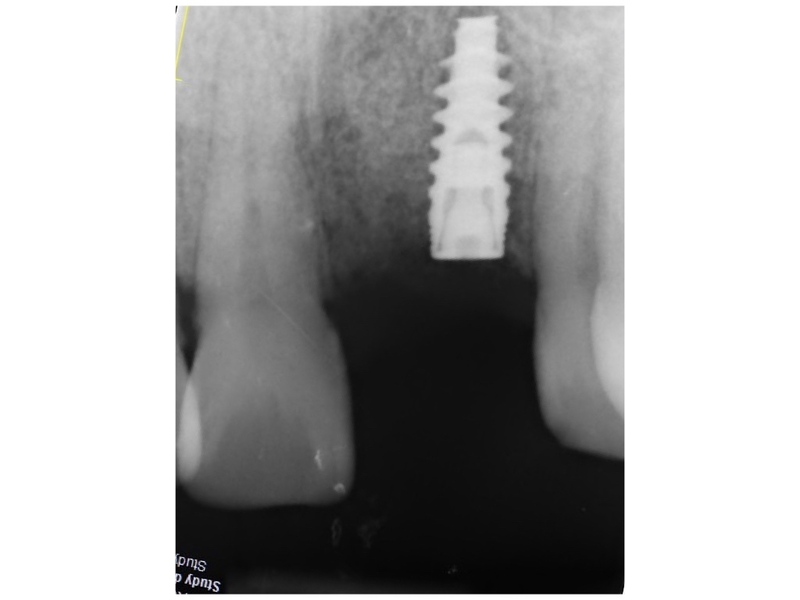 Close up view of the provisional over implant. Gingiva contour created by the provisional. An open tray impression was taken using a impression coping. X-ray of impression, necessary to locate the position of the coping. Cast models mounted in the articulator to fabricate the final restoration. Dento labial analysis of the final restorations. 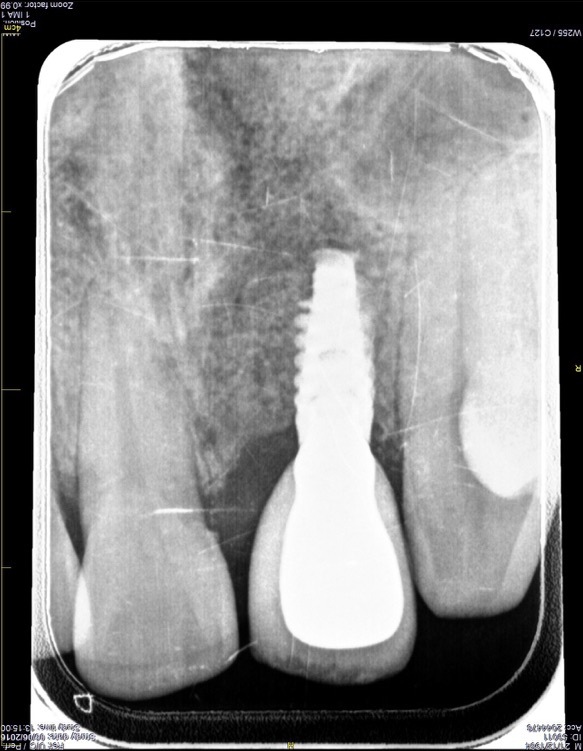 Final X-ray of the implant with the restoration. Final restoration over implant of the central incisor with a mesial diastema. 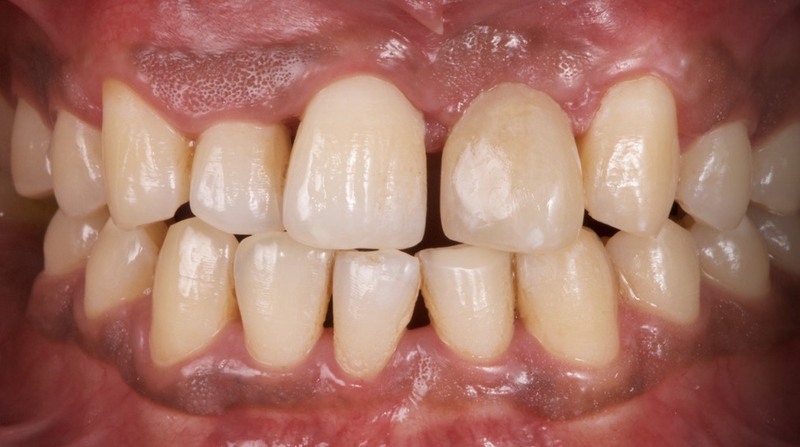 Fradeani, M. Evaluation of Dentolabial Parameters as Part of a Comprehensive Esthetic Analysis. The European Journal of Esthetic Dentistry 1 (1): 62–69. Manikandan Ramasamy, Giri, Ramesh Raja, Subramonian, Karthik and Rachuri Narendrakumar. 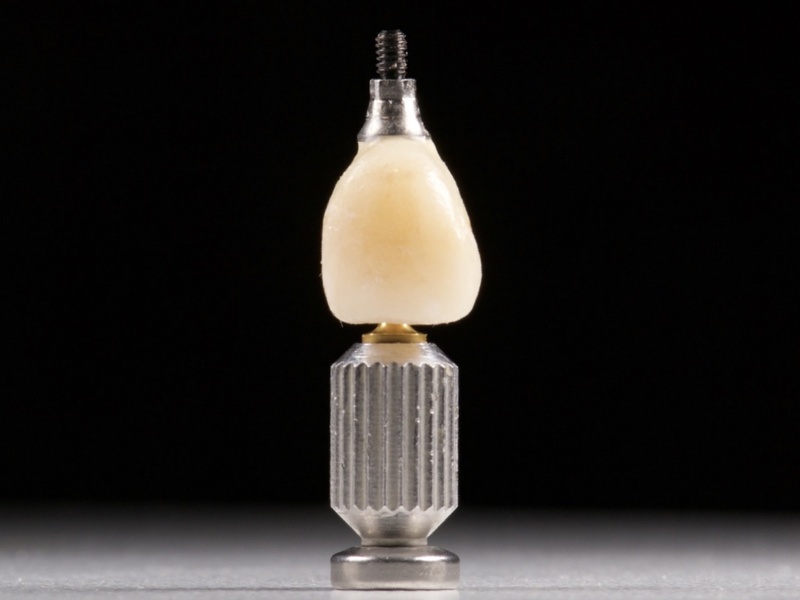 Implant surgical guides from the past to the present. J Pharm Bioallied Sci. 2013 Jun; 5(Suppl 1): S98–S102.